Our new trail pass program began July 1, 2015. In addition to your sled registration, you will need to purchase and display an annual trail pass on your sled on the front of your windshield as listed below. Non-Club members can obtain their annual trail pass for their sleds through the DNR directly and will pay $30. We, as AWSC Club members, can receive our trail passes through the AWSC for $10 per sled. FOR AWSC MEMBERS who want to mail in the trail pass order form, reference the above link. 1. Order online through the AWSC website at www.awsc.org with a credit/debit card (MasterCard, Visa or Discover), your AWSC member # (found on your yellow AWSC membership card or on the address label of your WSN magazine issued Sept-March) and your WI snowmobile registration #. Members who order online will receive one receipt, via the email provided when ordering, from Authorize.Net (the credit card company we use to process our credit cards). Note there is a $1.50 fee per transaction. 2. Call the AWSC Office (608.846.5530 or 800.232.4108) during business hours to order your WI Trail Pass with a credit/debit card, your AWSC member # along with your WI snowmobile registration #. 3. Walk in the AWSC office door (529 Trail Side Dr., Ste 100 – DeForest, WI) during business hours and order with a check or credit/debit card along with your AWSC member # and WI snowmobile registration #. 4. Mail in to the AWSC office (AWSC, 529 Trail Side Dr., Ste 100 – DeForest, WI 53532) a check or credit/debit card along with your AWSC member # and your WI snowmobile registration # on the Trail Pass order form (link above) or available from AWSC website or your Club Membership Chair. The order form will also be available in the September WSN magazine! Your membership dues must be current with your chosen AWSC club …… and your club must have your AWSC dues sent in and current with the AWSC office. Your assigned AWSC member number will be on your yellow AWSC membership card sent to you through your club, and on the address label of the AWSC magazine you will be receiving as a member. Your club membership chair will also have your member number listed on their current roster. YOU WILL NEED THAT NUMBER TO ORDER YOUR DISCOUNTED PASS. Snowmobiles must be registered in WI. Please note: For newly purchased snowmobiles with registration pending, please call the AWSC office. The sticker has to be on windshield (or center of hood if you change windshields). You can legally ride with your Trail Pass receipt. 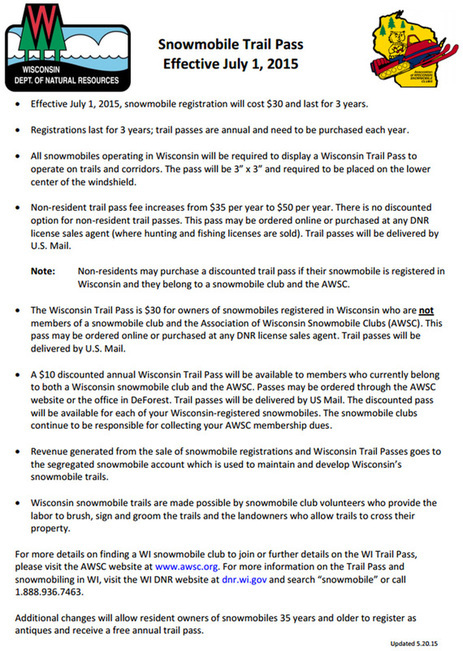 All Trail Pass stickers will be mailed via USPO from the State of WI. The fine for riding without a WI Trail Pass is - $250. THE TRAIL PASS FUNDS COLLECTED THROUGH THE AWSC WILL GO DIRECTLY INTO OUR SEGREGATED TRAIL-AIDS FUND WHERE OUR CLUBS CURRENTLY OBTAIN THEIR MAINTENANCE MONEY. It is up to all of us to pitch in, and help educate our membership as well as those who are not members, as this program should be a great help to fund our system.